Sometimes we forget what business we are in. It's easy to be caught up in listing and showing and negotiating and settling. But that's all just the mechanics of our business. Today I got a delightful reminder that we really do is make dreams come true. A few months ago, I wrote about a house that was a "disastrous, dirty, cluttered, smelly, mess" and could only be sold after it was stripped bare – carpets, appliances, window treatments, everything had to go. The buyers didn't think they could ask for that, but the sellers were delighted to take their "stuff" with them, and both ended up happy. The young couple who bought the home then painted, replaced flooring, did over the kitchen and bathrooms, and enjoyed their five-bedroom brick home for five years. Last fall we put this home on the market and it found new owners, a family with two young children. This house that was once a disaster area has become a family's dream home…again. They are so happy and wanted to show me how they are doing with their own decorating. The children's rooms didn't need any change – the girl's room is pink and white with a colorful border, and the boy's is Spiderman-blue. Colors in the bathroom they share work for both children. 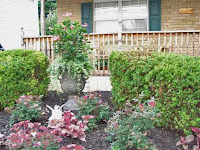 New landscaping has made the front more inviting, and wicker furniture makes the front porch a pleasant place to relax. 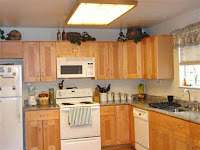 Inside, the still-new kitchen is warmed by decorative accessories above the cabinets. 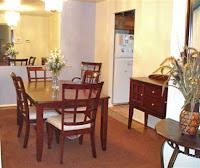 Some new furniture and a carpet remnant make the dining room inviting, and now the owner isn't bothered anymore by the parquet floor that she doesn't much like. The family room with its brick wall is warmer now with the sofa and comfy pillows. Some of the rooms, like the living room, are still a work in progress, but you can see that this is a warm and welcoming place. I am so proud of putting this family in what turned out to be their dream house. Knowing they are happy and that they wanted to share that with me – it was a feel-good day! And that is the business we are in. If you're anywhere near the east coast and someone mentions Atlantic City, you probably think of gambling casinos, the boardwalk, or Donald Trump. If you're a beach person, you will add the wide beach and splashing in the surf. Last week I discovered another side of Atlantic City…the truly sweet side. Sure the people were nice there, but the place was absolutely the sweetest thing ever. Really. 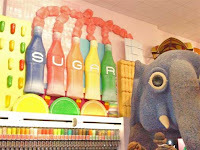 The sign out front says it all: IT'SUGAR. When you walk inside, you forget all about the food triangle and your latest diet. It is all about SUGAR in big bright capital letters. They have a wall of M&M's with dispensers in every color. How about that? Brown M&M's, my favorite color, and with my monogram already on each one! These will be my signature giveaway. You can get an idea of the scale of the place in the picture with the elephant – notice the heads of people in the bottom right? Yes, it was that big. I love the sentiment of that sign, though – candy for breakfast because, after all, it is the most important meal of the day. It's true you can make your own candy bar – my daughter-in-law's birthday was the next day and we made one especially for her. As if the M&M's weren't enough, the cases were full of luscious looking fudge in any shade of chocolate you want. Yes, we bought some of that to take home, and no, I will not discuss how much of it made it all the way back to Baltimore. It was a beautiful warm-but-not-hot day at the shore, and after all that sweetness we headed back to the hotel to relax and take in the view. Ah, what could be better? Salt air and sweet candy. Delicious! It was another beautiful day, and we decided to have a "vacation" in Baltimore one day at a time. We recently visited Fell's Point, and this day it was our own Inner Harbor. We slipped into a convenient parking space and proceeded to act like tourists, enjoying the sights along the waterfront. 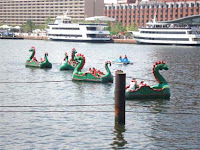 The dragon paddle boats are always popular in the summer, and there's a water taxi for those of us who prefer to let an engine do the paddling. Baltimore's World Trade Center soars above the harbor, with a 27th floor observation deck for stunning views. Moored down below along the harbor are historic ships that are National Historic Landmarks and also serve as living classrooms. The queen of the harbor is, of course, the USS Constellation. She is the last all-sail warship built by the U.S. Navy, and the last Civil War era vessel still afloat. The ship is open year-round and offers a variety of special educational tours. Youngsters enjoy the Powder Monkey Tour that includes some hands-on learning of what it was like for boys 11 to 18 who served on warships in mid-19th century America. A bit further along the harbor is the U. S. Coast Guard Cutter Taney, a veteran of Pearl Harbor, and the only surviving vessel still afloat of the 101 that were present and fought during the attack on December 7, 1941. She went on to serve in the Okinawa campaign, the Korean War, the Vietnam War, and in the war on drugs in the Caribbean. And then moored at another pier are the Lightship Chesapeake and the submarine USS Torsk. Once there were ships like Chesapeake anchored all along the coast, marking entrances to channels, and warning of hazards to navigation. The ships provided weather information and helped in rescue operations. During World War II the ship was "drafted" and did harbor patrol duty near the entrance to the Cape Cod Canal in Massachusetts. With peace, Chesapeake came back to Maryland, then to the Delaware Bay until 1971 when she became an ocean-going environmental classroom for the National Park Service. 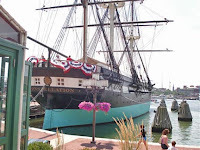 She came home to Baltimore in 1981 to join the Baltimore Maritime Museum. The submarine Torsk was late getting into the action of World War II when commissioned in December 1944. She headed for the Pacific in early 1945 and took up patrol in the Sea of Japan. Her crew made history on August 14, 1945, when they sunk the last ship of World War II; less than 24 hours later hostilities ended. Until her retirement in 1967, Torsk was in the Atlantic and Mediterranean fleets, and was part of the blockade keeping Soviet missiles out of Cuba in 1962. The National Aquarium is worth a day trip itself. Visit Australia, experience a tropical rain forest, and enjoy the dolphin show, all in the glass pyramid buildings on Pier 4. 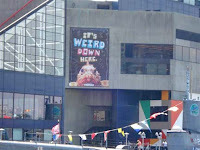 That sign, "It's Weird Down Here" is advertising the strange fish you can find at the aquarium. 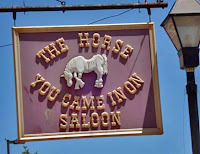 We didn't realize just how right that sign was until we were headed back to our car. Just as we stepped out from a building entrance we heard the sickening crunch of metal on metal as two SUV's collided just feet from us. One of them ran up on the sidewalk, took out a huge light pole, threw it's bumper in our direction, and ended up way too close for comfort. 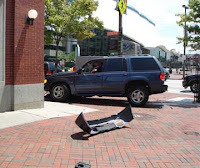 We had to jump to get out of the way of flying debris – talk about scary! Fortunately, no one was hurt, but it is definitely weird down here! We were leaving any way, but after that it was time to head home. Even with that unwelcome adrenaline rush, we still enjoyed our one-day vacation. When you visit Baltimore, be sure to plan on spending some time walking along the harbor. I promise – SUV's on the sidewalk really are quite rare. After several days of high heat and creeping humidity, the weather broke and brought warm, cheerful skies. It was absolutely perfect for wandering about the cobblestone streets of Fell's Point. 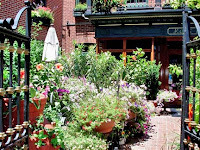 This historic waterfront community, east of Baltimore's Inner Harbor, is sprinkled with shops, restaurants, and lively pubs. Fell's Point is a National Register Historic District dating back to the Colonial era. Englishman William Fell bought the land in 1726 and saw the potential for shipbuilding in colonial America. Later, his son and widow divided the land and sold lots beginning in 1763 as others recognized the potential of the deepwater port. Before long, Fell's Point grew into a bustling seaport with docks, warehouses, shipyards, homes, and stores. The USS Constellation, the last Civil War vessel still afloat, was built here in 1854, and today is berthed in Baltimore's Inner Harbor. The oldest house in Baltimore has stood here since 1765 and is now a museum. There are many houses and commercial buildings that date to the 18th and 19th centuries – Historic District Plaques on properties abound here. Small row houses share space with large town home developments, specialty shops, and familiar TV and film sites. There are theaters, art galleries, museums, book and antiques stores, and ghost tours for those who like their history on the spooky side. The historic Broadway Market is worth a trip for fresh produce, meats, seafood, dairy, and baked goods. For several years, the whole country knew the City Pier as Baltimore Police Headquarters, thanks to the filming of Homicide: Life On the Street here. Festivals are a Fell's Point specialty – the annual Fell's Point Fun Festival draws some 300,000 people. There is a Privateer Day (can you say "Aargh"? ), Halloween, winter holiday festivities including the Miracle on Main Street and the Parade of Lighted Boats, plus fireworks on the 4th of July and New Year's Eve. Snowballs and saloons, both mainstays of the area, adjoin city gardens and eco-friendly buildings like the Mikulski Workforce Development Center with its green roof. U. S. Senator Barbara Mikulski is an advocate for Baltimore and especially Fell's Point; long before the area became popular, she helped lead the fight against an extension of Interstate 95 that would have destroyed Fell's Point and much of Baltimore's Inner Harbor. But on our visit we weren't thinking about history or Homicide. We simply enjoyed the wandering, people watching, and being near the water in this eclectic part of Baltimore.